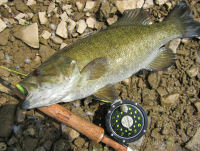 Back in 2010, I had a great day fishing for small mouth bass in some creeks I decided to re-visit recently. I made my return to the same holes where once again I had a great experience, finding several fish…and one great big bruiser that snatched my streamer after breaking me off. There is just something about fishing these spring fed creeks especially knowing that there could be the next big one lurking around the corner or in the next deep hole. The water on this particular Saturday was up due to the abundance of rain that we have had but surprisingly it was very clear and in some ways looked like a world class trout stream; at least I allowed my mind to wander off somewhere else and could see trout hiding and waiting to ambush my fly. As I stepped down into the first hole I noticed how gin clear the water was and immediately knew that stealth was going to be an important part of being successful as smallmouth are skiddish at best and in a small stream they need to be treated like our eastern and native brook trout…stay low and walk quietly when entering a pool. I stripped out 20 feet from my Cabela’s TQR (Tight Quarters Rod) 2 weight and made a cast toward a downed tree that has held fish before…as I was stripping in my streamer I noticed a quick flash from a fish in the depths and knew it was an interested bass. I hauled my line and made the same cast allowing the fly to gravitate toward the bottom…when from behind I saw an enormous fish in pursuit. I gave a quick ‘tickle’ of the fly and the beast opened its mouth and sucked in my Irish Jig streamer which is a kissin cousin to the Civil War Streamer. The Irish Jig has the basic colors of light green and dark green as well as the silver flash for the body. I strip set the hook and watched in amazement as this fish leapt into the air not 10 foot away; it was without question the largest smallmouth I had ever seen in person. I kept the line tight and survived the first big run and couldn’t believe the pull that this fish was putting on my rod. The second run was just at strong and when the fish bottomed out I put too much pressure on it and it broke me. This is the part where I stood, head down in the stream lamenting the loss and knowing that I had just been beaten by a true gem of a fish…so it goes! I quickly re-tied yet another Irish Jig streamer and made another casts in the same spot and a 12 incher engulfed the fly, followed by two more smallies and a plump rock bass. This hole was alive and the fish were in feeding mode. I ended up landing a few more before moving downstream to the next hole where I landed a few more smaller fish…all giving me a great fight on the small two weight rod. The third hole provided the best results of the day as it was a long thin hole no more than 10 feet across and deep at the portion right below the bank. I was cautious to make accurate cast and keep my silhouette low to not spook fish. I made a cast up against the bank and allowed it to sink and was casually stripping in the line when the tug on the other end made it clear that I had hooked a good fish. After breaking off the first big one I had made up my mind to go to the reel on the next big one and thus I switched hands and for the next few minutes I battled the fish using the right hand reel. For those of you not understanding or thinking that reeling with the opposite hand should be no big deal…it is! I am a creature of habit and Lord knows how many fish I have battled using my right hand as my rod hand and my left hand as my reel hand and doing it any other way is and was tough. I was quite proud to land the 16 inch smallmouth and it gave me one of the best battles I have ever had. When I finally moved into shallow water where I could beach the fish, he and I were both tired. I quickly snapped a few photos and removed the streamer…then nursed the big fish for a moment until it jetted away back to the depths it came from. Southern Indiana is full of these small streams and you would be surprised at how small their holding cover is…so get out there and get going; no matter if you are fly fishing or using an ultra-light you will find smallmouths to be a fish of great strength and endurance. Once quick reminder that these are very slow growing fish and my 16 inch smallie was probably about 16 years old…so please practice catch and release and let someone else follow you up as they too Enjoy the Great Outdoors.